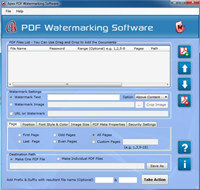 Create watermark on pdf software is right choice for setting watermark on pdf document. User can select text, image, logo, stamp, url, copyright symbol, signature, roll no etc as a watermark. Application allows setting watermark above of content, below of content as well as user can replace content with watermark. Tool support most of all option like page, positions, font style & color, image size, pdf meta properties and security setting. Using above option user can select page where you want to place watermark like first page, last page, odd page, even page, all page and custom page (1, 2, 5, 8-11). You can create single pdf file as well as multiple. Apex Create Watermark on PDF is an utility that works under windows xp, windows vista and windows 7. It supports both 32-bit & 64-bit windows editions, therefore it could run faster on 64-bit computers. Estimated download time for Apex Create Watermark on PDF on a common adsl connection is less than a minute. Version 2.3.8.2 was released one thousand eight hundred thirty four days ago by Create Watermark on PDF. Click the green download button to download it now.